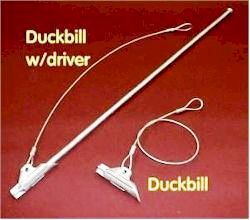 Duckbills Canopy Anchors are driven into the ground (no holes, no digging, no concrete!). Duckbill Anchors provide a safe and environmentally sensitive installation. 1100 lbs average holding in "Normal" soil conditions. This will vary with moisture, soil composition, and depth of anchor. An upward pull on the anchor tendon rotates the Duckbill into a perpendicular "anchor lock" position in undisturbed soil.